This definitely wasn’t in the flight plan. 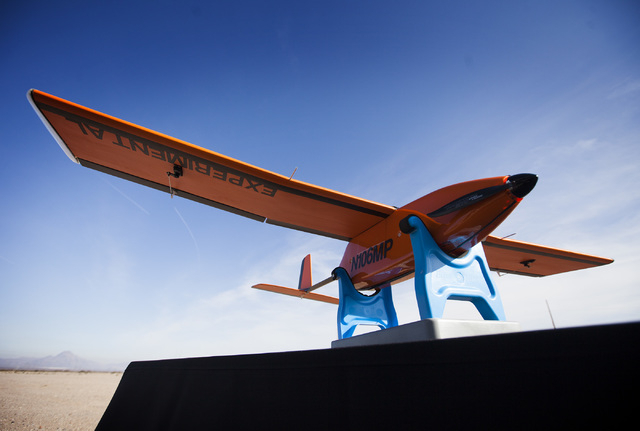 About 50 dignitaries had gathered in the desert for a demonstration flight of Sensurion Aerospace’s flagship Magpie unmanned aerial vehicle. All collectively gasped as the 5-foot aircraft crashed seconds after a company executive launched it. The Magpie, which had flown successfully about two hours earlier, was hand-launched, but sputtered and plunged to the desert floor Friday in a graded clearing near the Copper Mountain Sempra Solar plant about 20 miles southwest of Boulder City. Company officials said the vehicle was undamaged, but they opted not to fly it again until they could review control systems and figure out the problem. One executive said it probably was an electrical controller malfunction. So much for Nevada’s first UAV commercial test flight demonstration. But Gov. Brian Sandoval, who joined a group of state and federal dignitaries in a ceremony before the planned demonstration flight, wasn’t fazed. 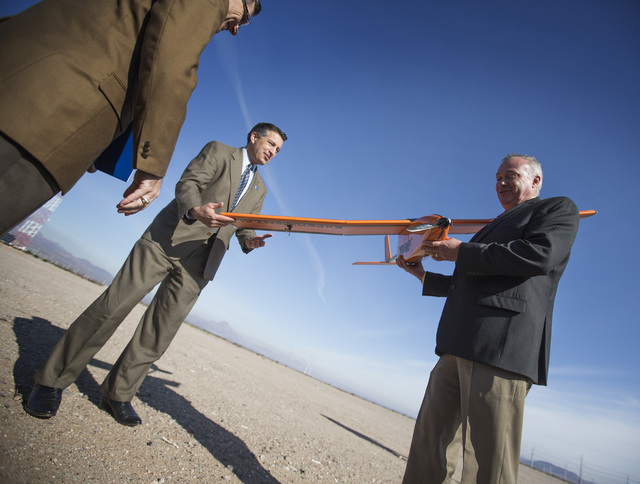 Sandoval, Sen. Dean Heller, R-Nev.; Rep. Joe Heck, R-Nev.; and Glen Martin, regional administrator of the Western-Pacific Region of the Federal Aviation Administration, had just lauded the yearlong journey Nevada had taken to reach Friday’s test flight. Even though Magpie didn’t perform before television cameras, journalists and dignitaries the way it did in the actual first flight, supporters were happy for the state to clear another hurdle in its bid to become the drone capital of the world as Sandoval envisions. Nevada was the first state to complete required training and processes to receive a certificate from the Federal Aviation Administration enabling it to conduct its own certifications. That means the nonprofit Nevada Institute of Autonomous Systems, a part of the Governor’s Office of Economic Development, can review any company’s unmanned aircraft’s airworthiness and specifications and issue a certificate for it to fly. Previously, companies had to wait in line for certification through the FAA, a process that could take months to complete. The state has the added advantage of being able to provide a company with several test sites to prove the systems can do what the designers say they can. The state has four locations for future tests: a facility at Boulder City Municipal Airport; Stead Airport north of Reno; Fallon’s municipal airport; and Desert Rock, a private airfield near Mercury associated with the Nevada National Security Site. The four locations let Nevada provide a variety of test conditions. “Who would have thought that on Dec. 19 the weather would be nice enough to conduct an outdoor UAV test flight?” said Steve Hill, director of the Governor’s Office of Economic Development and one of the state’s key point men in getting the state’s program off the ground. Friday’s flight was conducted near the solar arrays at Sempra’s invitation because it had an easily accessible, graded area suitable for the flight and ceremony. Sensurion’s Magpie was the first vehicle certified by the state. Dan Johnson, vice president of business development for Minneapolis-based Sensurion, said the vehicle is designed for video surveillance. It also can fly other types of sensors to monitor other types of systems in remote areas. Johnson said the vehicle could monitor power-line infrastructure and easements in remote locations at far less cost than it would take a piloted aircraft or crews on all-terrain vehicles. He added that although technologists have devised systems for drones to help fight fires, find injured people on search-and-rescue missions, prospect for minerals and precious metals and map terrain, there are applications that haven’t even been thought of.